Home (old) - Art for Dogs' Sake! ﻿Full colour catalogue available to view online or download from late March 2015. Renowned animal artists and sculptors Ostinelli & Priest have kindly donated a fantastic piece, similar to 'Spider' pictured above, for the exhibition and auction. Art for Dogs' Sake is an artist led, open submission exhibition giving artists working in any medium a platform to ex﻿hibit﻿ their artwork and reach new audiences. While our fun, dog themed event is designed to celebrate the relationship between man and his 'best friend', artists are invited to submit work on ANY subject matter of their choosing. Who's behind Art for Dogs Sake? Artist-focussed, Art for Dogs' Sake has been created by artists based at Hadleigh Old Fire Station (HOFS). It is an opportunity to raise funds for Love Cyprus Dog Rescue, which has been set up by one of HOFS' studio holders to raise awareness of the hundreds of neglected, abused and abandoned dogs in Cyprus. 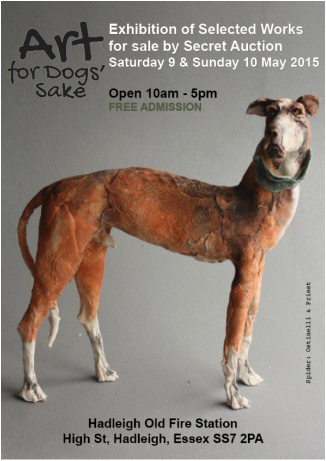 Art for Dogs' Sake is supported by the organisers of Hadleigh Art Trail, who are based at Hadleigh Old Fire Station. The Trail is an annual arts event now in its fifth year, popular with artists and visitors alike. Hadleigh Art Trail is a professionally run not-for-profit, community focussed event that receives no external funding. Submit as many works as you wish along with a submission fee for each work. Follow the three easy steps under our SUBMIT section. Artists' work will be selected by a panel of established arts professionals (meet our selectors here) and professionally curated. Art enthusiasts and investors can attend this prestigious event with the chance of securing artworks by both established artists and up and coming talent alike. All selected artworks will be for sale by 'sealed bid'. You tell us your minimum price for each artwork on the submission form (this will be published as a reserve price in the catalogue) - when deciding the price please take account of our percentage commission on sales. Sale proceeds will be paid to the artist; the commission we retain on sales will be split equally between Love Cyprus Dog Rescue and the Hadleigh Art Trail in 2015. Art buyers can bid in person at the exhibition or via an online form﻿ from late March 2015. ﻿ Unsold artwork will be returned to the artist. What is Hadleigh Old Fire Station? Now an established arts and community venue, Hadleigh Old Fire Station (HOFS) is an iconic historical building in the centre of Hadleigh, Essex (home to the 2012 Olympic mountain biking event). This once operational Fire Station was transformed in 2011 into artist studios and a large, bright community and exhibition space in the former Appliance Bay. Submission deadline: Monday 16 March 2015. Midnight GMT.